I want I want I want. But can you blame me? The sun is finally out (for good?) and I’m ready to take advantage of it. I’ve been so preoccupied by everything house-related, that I haven’t taken a good look at my closet in months. It’s not that I’d head straight to my favorite spots and blow a bunch of cash all at once – I’m far too cheap for that – but everybody deserves a couple summer staples to freshen up the rest for those 75 degree and higher days into nights we all love here in Seattle. I truly heart a high-waist bikini bottom. And a fashionable way to keep premature wrinkles off my chest. Suit courtesy of Urban Outfitters. Does it count as another pair of aviators if they have a little flare on the sides? They are the best. I think everybody has had a few bummer birthdays – expectations set too high, or perhaps there wasn’t enough ice cream cake – but for the most part, they are that one day a year when everything you do or feel should be extra special. I never work on my birthday. When I was in school, it was during summer break, and since then I’ve just always made a point of taking the day off work. This, along with lunch and shopping with my pops, are my lifelong traditions. This year might be one of my favorites. Highlights I didn’t capture on “film” include waking up to roses and treats from our local coffee shop (a mocha from Zoka – thank you for the suggestion, Teeny – Joe, you’ve been outed), Sculpt at CorePower to all my favorite Top 40 hits, a mani/pedi, blonder more sun-kissed hair, and a glass of rose with the honey in the yard before dinner. 1. Take some time to wash away any expectations of what will be. 2. Also take some time to decide what you can do for you. 3. Buy yourself something totally cray. 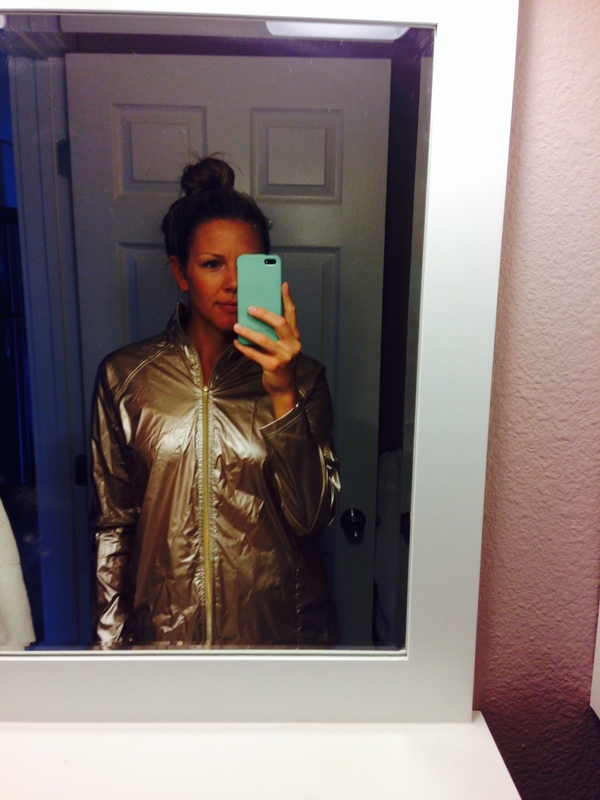 Like, I don’t know, a shimmering gold yoga warm-up jacket. I don’t usually do true selfies, but the jacket just had to be showcased. 50% off at the studio, say whaaaat? It was meant to be. I admit it… I spent a lot of time at home this weekend. But it felt so good. Friday evening was brown sugar & honey marinated salmon and quinoa salad on the couch with one of my faves, Saturday was my inaugural visit to Flywheel Seattle (I was put in my place, to say the least) and my inaugural visit with one of the cutest 8-week(ish) old dudes around (weekend regret is not getting the camera out – I’ll snap some pics next time), and Sunday was a ridiculous amount of R&R, yoga…and House of Cards. I also ate a whole watermelon. To myself. They are in season and you should get yours. I didn’t get a picture of dinner on Friday, but I did capture my “leftover hash” in the making today. It’s become a hobby of mine on Sunday mornings to throw whatever veggies/starch I have in the fridge into a pan, fry it up, top it off with some Herbs de Provence, and add a couple eggs. Always different and always delicious. 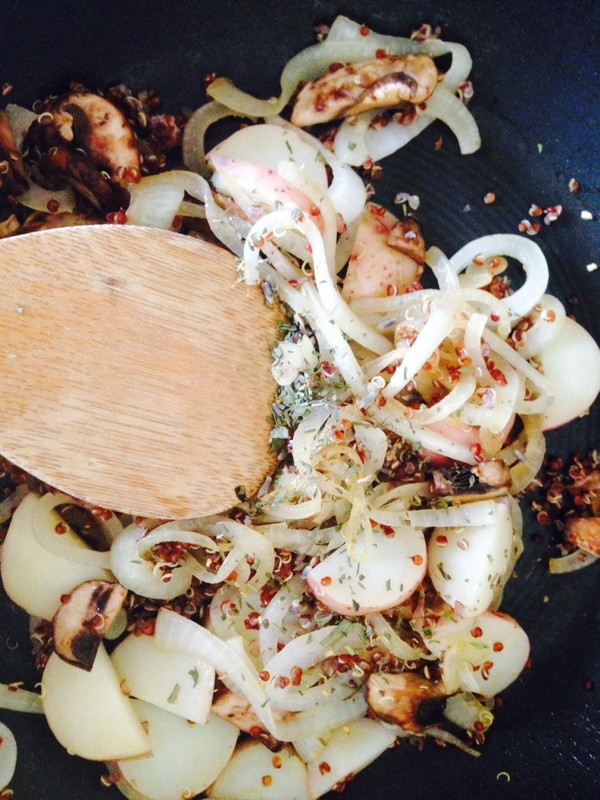 Caramelized onions, mushrooms, quinoa and new potatoes. I would have loved to have had some beets laying around. Breakfasts, of course. I’ve been recreating in my own kitchen, but it’s not the same. The Grand Bazaar was crowded and overwhelming, and everywhere you turn a salesman wants to “ask you a question” or “show you something very quickly”. An experience, but I preferred the much smaller Arasta Bazaar just behind the Blue Mosque. 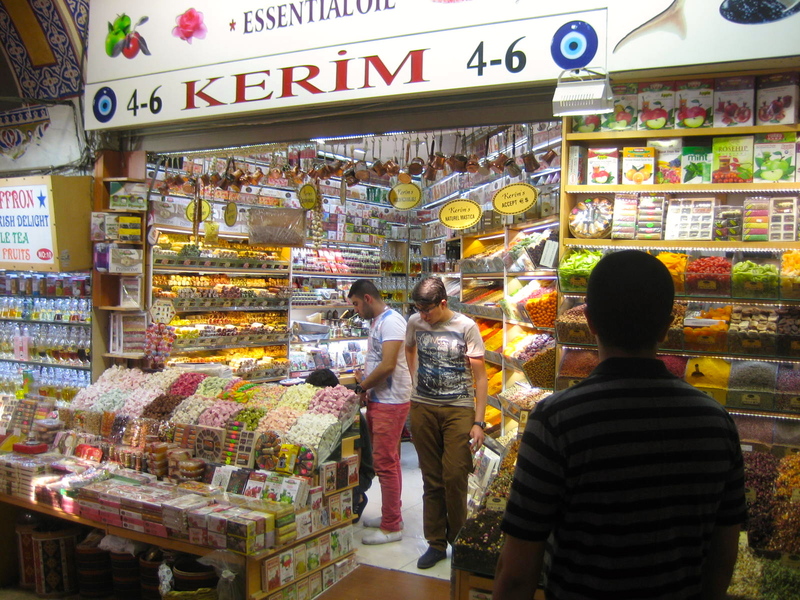 Grand Bazaar – spices and turkish delight for days. 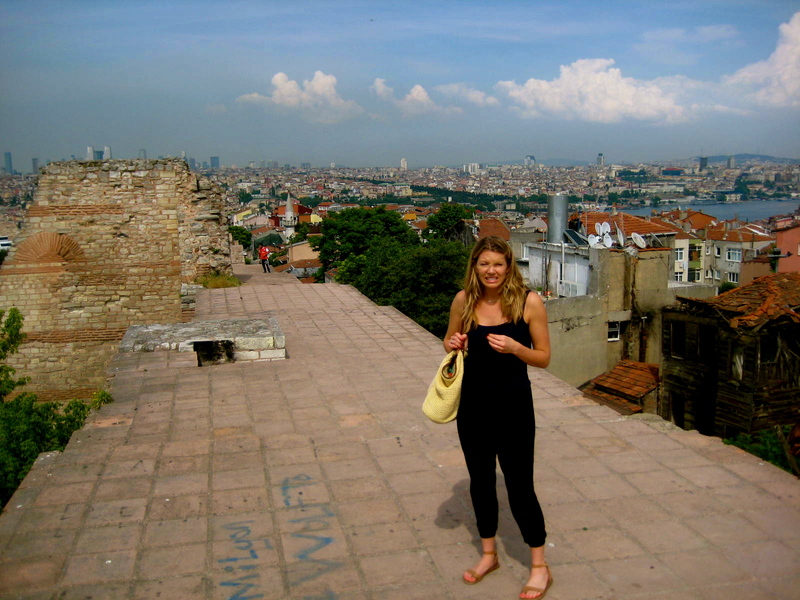 We took the light rail out to the Byzantine City Walls of Constantinople, where there wasn’t much to look at. Joe was obsessed with walking along it, under it, over it and near it. Me on the other hand, I just wanted to get off of it. Thank you, G, for instilling in me a deep, deep fear of heights. 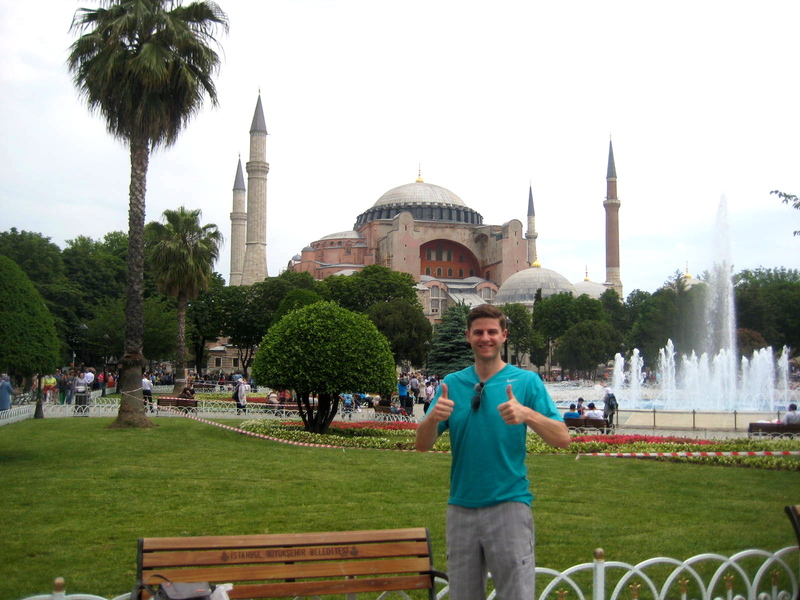 The Hagia Sofia & Mosaic Museum were both incredible and very complimentary of each other. I strongly recommend purchasing the three-day museum pass for the savings in money and time, and a little nudge to see a bit more. The Hagia Sofia is a basilica turned mosque; most of the mosaics had been covered by medallions with words of the Quran. The building is crazy big and crazy old, and it’s a trip to see the arches bending under the pressure of it all. Scaffolding covers a good portion of the inside and has for some 20 years because they keep running out of money for restoration. 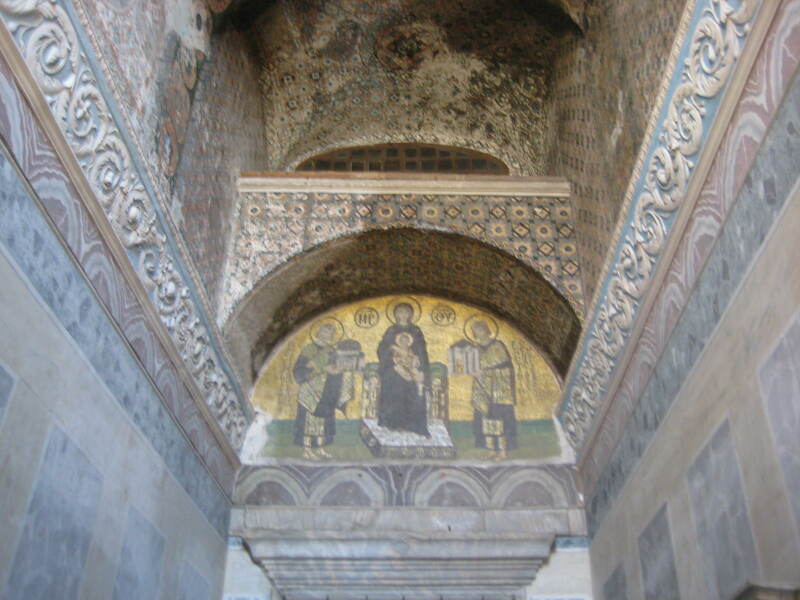 The medallions adorning the walls and ceilings are beautiful… but of course my favorite part was the mosaic fresco on the ceiling when you enter. Did they miss this one when they were covering all the faces? 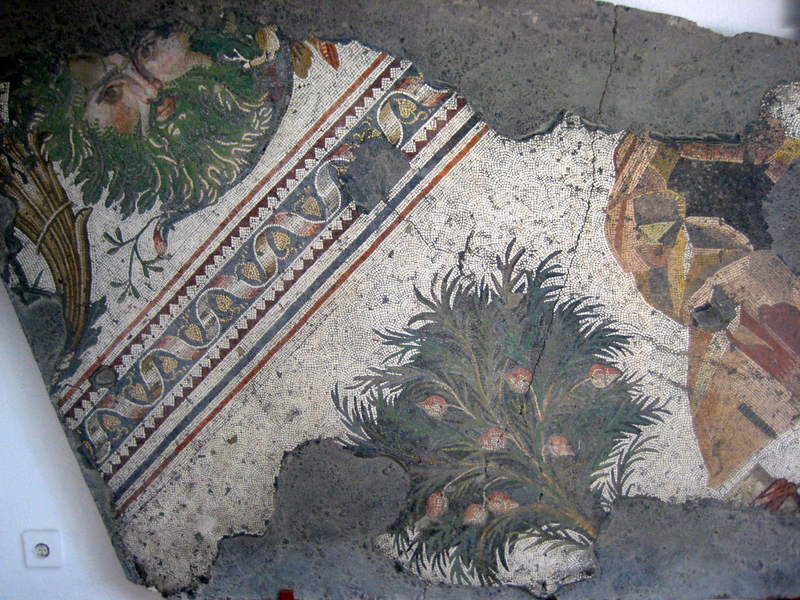 The Mosaic Museum is small and contains all mosaics pulled from Palace grounds. It is literally a collection of the sidewalks royalty walked on thousands of years ago. Very fancy. Mosaic Museum – look closely and you can see thousands of tiny tiles. 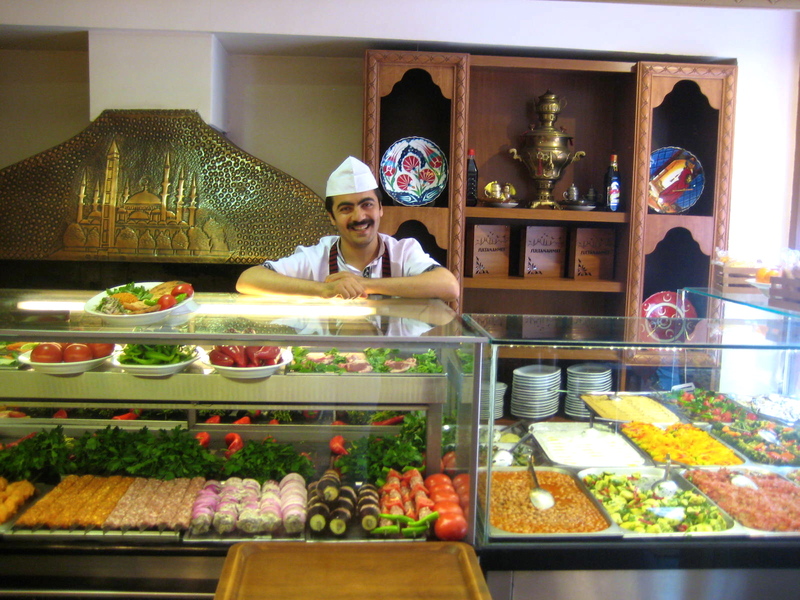 We did eventually make it to a typical Turkish cafeteria a la Rick Steves. Had no idea how to order, so we definitely wound up with three entrees, but it was delicious and an experience I wouldn’t want to miss. As I put these posts together I realize just how much we explored and experienced the city. Between Joe’s hunger for history and my need to stop at every Turkish towel store in town, I am so happy to say that we saw quite a bit. It’s taking awhile to pull it all together, but I’ll work on posting the rest of the trip in the next few weeks. It’s telling that we are still in Istanbul, which were just the first four days of a two week adventure. Stay tuned! The theme of the weekend was definitely “outside”. I came home on Friday (my first real Friday home since we moved in) and dug right into building the first of two Adirondacks (Cost Plus, $99, easy-to-build). I’ve been waiting so long for these, I didn’t know what to do with myself when it was done. I honestly just stood there and stared. I still do when I catch a glimpse of it through the back door. That I don’t have to cross my fingers on approach to the coffee shop in hopes one is a) available, and b) in the sun, feels nothing short of a miracle. 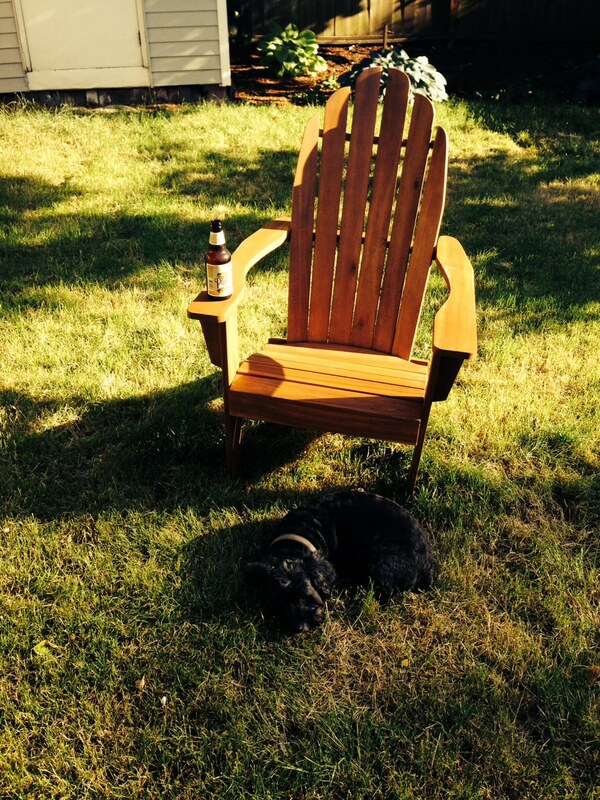 Loki guards the Adirondack, and my beer. He knows what’s up. This post is much delayed, but I have a good excuse: in the best way possible, it’s been nonstop with the house. So many little projects filling up all those 15-45 minute chunks of time I find during the week, and in this case weekend. And I promise to share those with you. For now, my weekend update… from a week ago – I was in the Bay for all of 36 hours, so I stayed in the Outer Sunset with Andyman and Anne on Thursday, and with the pops on Friday night. 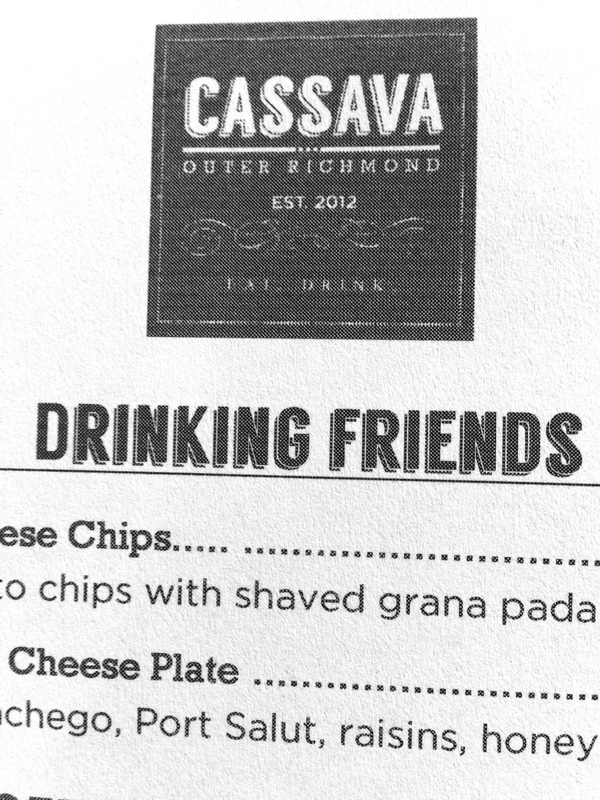 The kids wanted to do a fun dinner on Thursday, so Andy and Anne took me to Cassava, a small, cozy and cute little spot in the Outer Richmond I now highly recommend, to anybody and certainly those who are gluten/wheat-free. No promises to the GF, because all I am looking to eliminate is wheat, but ordering was cinch and I wasn’t very limited. 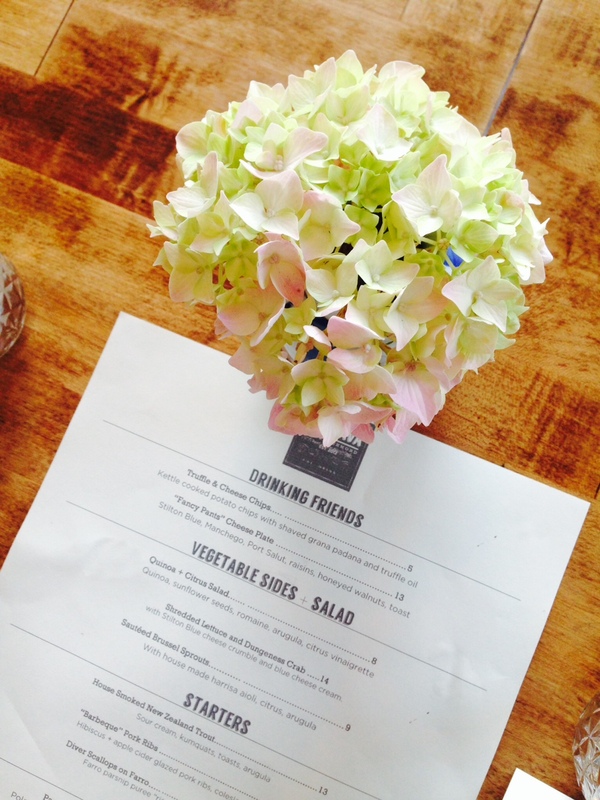 i think i learned this weekend that these are hydrangeas…copycat decor in the house coming on the next post. 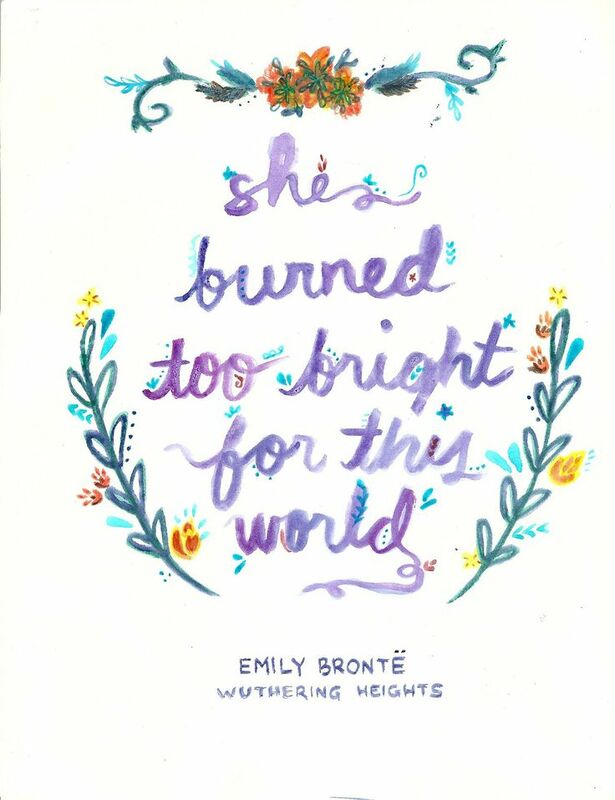 I have a Pinterest board dedicated to images that make me feel warm and fuzzy inside. Today is going to be a long one as I head to Port Orchard to meet with our volunteers; one of my favorite parts of the job, but 12 hours is exhausting no matter how you look at it. So here’s to conjuring up a few images that always make my day while I’m in the ferry line, eating lunch in the car, or rushing through emails to make it to said ferry line.